[For 2013 only] Now we've already discussed how Edy's / Dreyer's has ditched the girl scout branding of their products (because it has moved over to Breyers), so let's jump right into the ice cream. 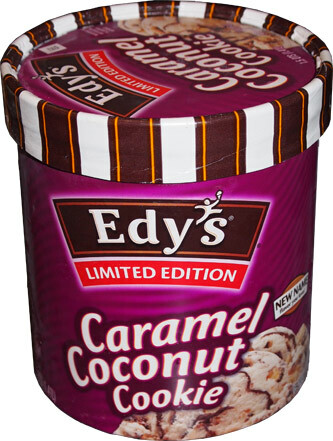 This is Caramel Coconut Cookie and just like every other flavor from Edy's / Dreyer's, it has no official description on the package..... but the website is finally updated and says "The way this cookie crumbles is simply amazing. 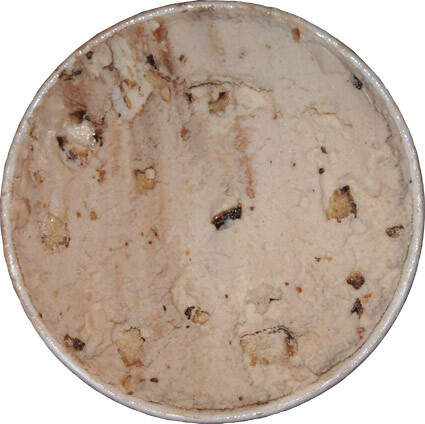 Coconut-covered cookie pieces and fudge swirls in caramel flavor ice cream". Popping the top and even a coconut hatin' punk like myself is intrigued by the cookie bits everywhere. Notice anything funny about this picture? Upper right quadrant there? Yeah, this is the bottom of the container. We blew through this one in no time. I knew my wife would dig it, and she did, but I really didn't expect to like this one myself. Coconut may be in the title, but it really takes this nice light touch to the situation. I'm thinking ice cream, I'm thinking caramel, I'm thinking cookies, I'm thinking sweet... and then after all that, then I'm thinking about the coconut. Nice job on this one Edy's. Sure I was doing small servings as to not push my luck, but I've got no complaints here. I was more than happy to plop infront of the TV with this. Caramel Coconut Cookie is a flavor for everyone, not just the coconut lovers. There's a description up now "The way this cookie crumbles is simply amazing. 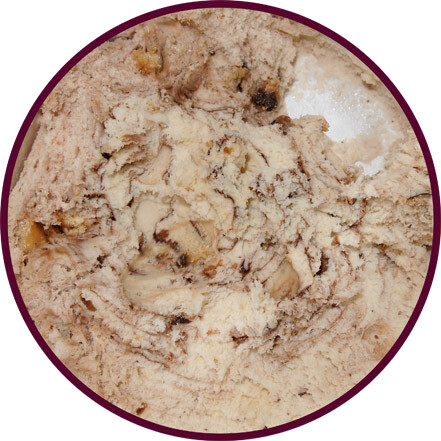 Coconut-covered cookie pieces and fudge swirls in caramel flavor ice cream." thanks, I forgot they had fixed their website finally. Oddly, the Slow Churned version tastes a lot better. Why did they stop selling this flavor ice cream? It was one of my favorite. @Anon: Well they only made this for one year after Breyers one the rights to make Girl Scout flavored "ice cream". I'd hazard a guess that's Breyers shut them down completely sometime after that, but I don't know for sure, it could have just been slow sales as well. This ice cream was amazing! I'm not even a ice cream person but I would eat the entire container all by myself in two days so it was a good thing it was only seasonal! When I saw Breyers started making it instead I bought it because I just had to have it. It was HORRIBLE! I took 2 bites and threw the whole thing in the trash. The coconut is so over powering that you couldn't taste anything else. I don't know why they switched over to Breyers but it was a huge mistake!